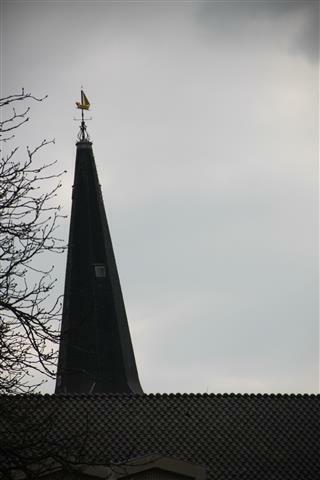 On the corner of the “T” intersection opposite the “Den Engel” (The Angel) Hotel, stands the old ‘Stadhuis’ (Town Hall). 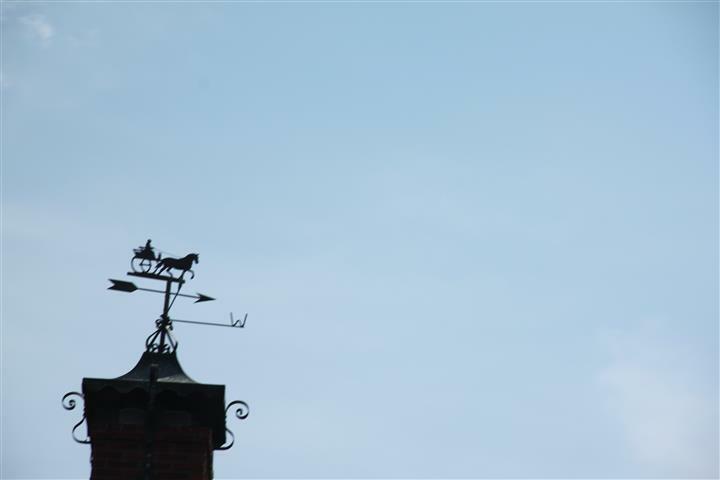 Since I have a small obsession with weather vanes, I photographed this one quite a lot (please endulge me) after all what’s not to like when wrought iron and art come together? 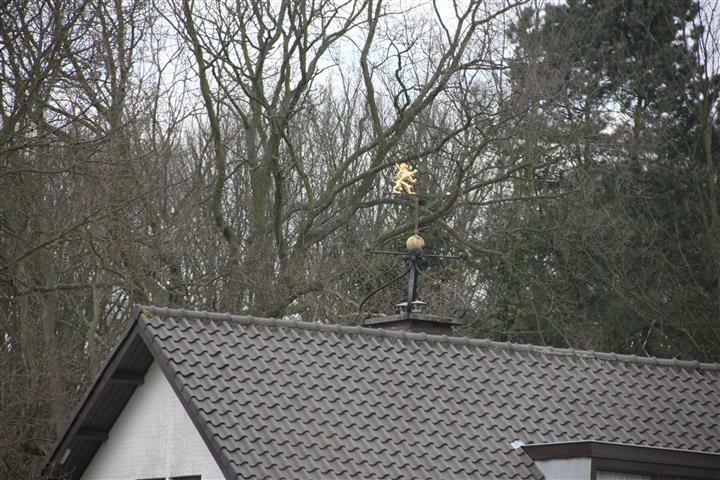 This weather vane depicts a little sailing vessel navigating a rough sea, the black ironwork supplemented with gold highlights. 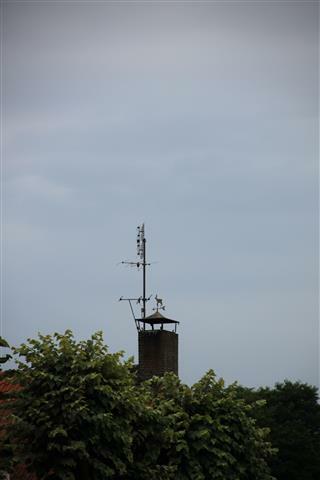 Not only is the building an imposing structure, I find the tower to be a wonderful piece of architecture too. Both were difficult at first to photograph from close by and I only the next day found a better vantage point from across the street when we approached from the other direction. 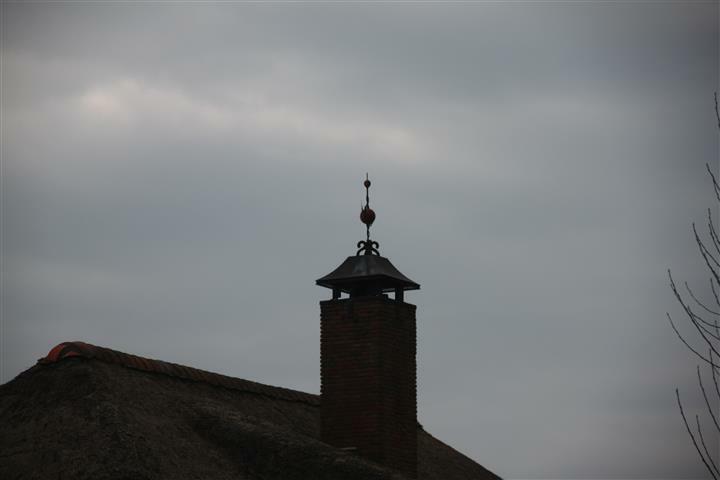 The weather varied considerably even throughout the length of one day, but we were lucky most of the time and kept more or less dry. Taking the wheelchair we went back and forth around the center of town so these are a compilation of photos taken during our stay. 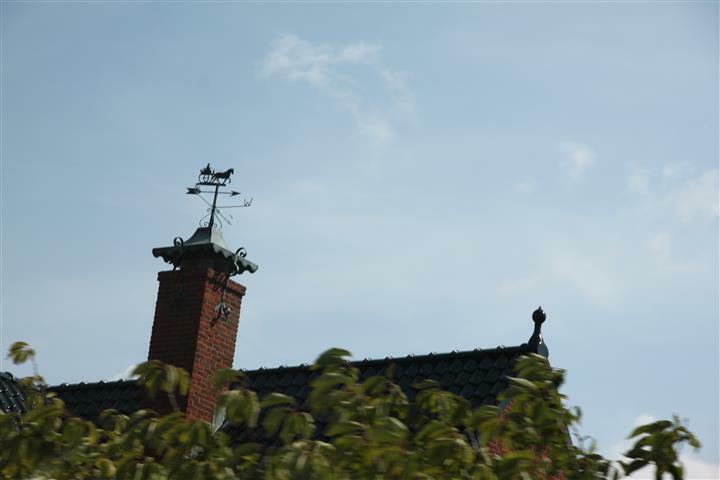 My Collection… Is In The Wind? Who doesn’t carry a camera in their lap whilst travelling in the front passenger seat of their car? It seems to be one of my only post-accident advantages: that I have my hands free because I am no longer in the driving seat. The irony of that however is that I enjoy driving more than Himself does, but that’s become irrelevant now. 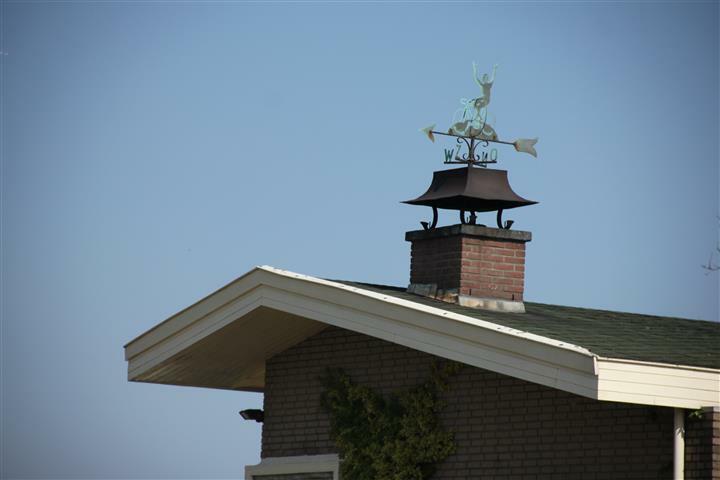 One of the things in my “collections” of photographs are images of weathervanes located on house chimneys. 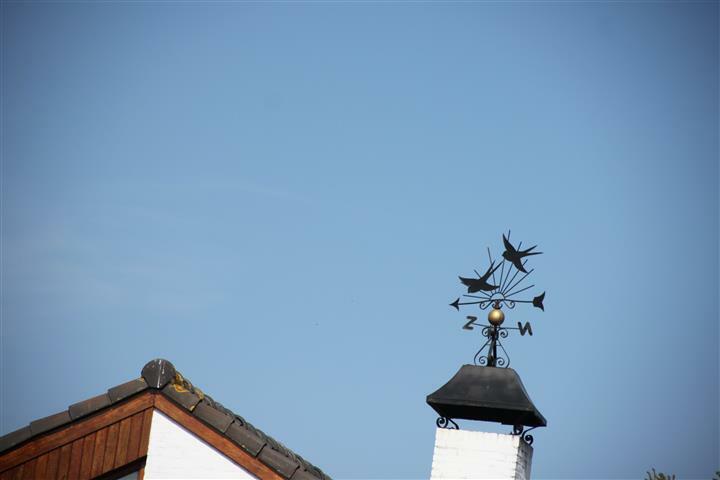 City houses tend not to have them because high density housing doesn’t lend itself to having a clear view of your own roof, but where ever there is enough space for free-standing houses, you can often find a wide variation of weather vanes. 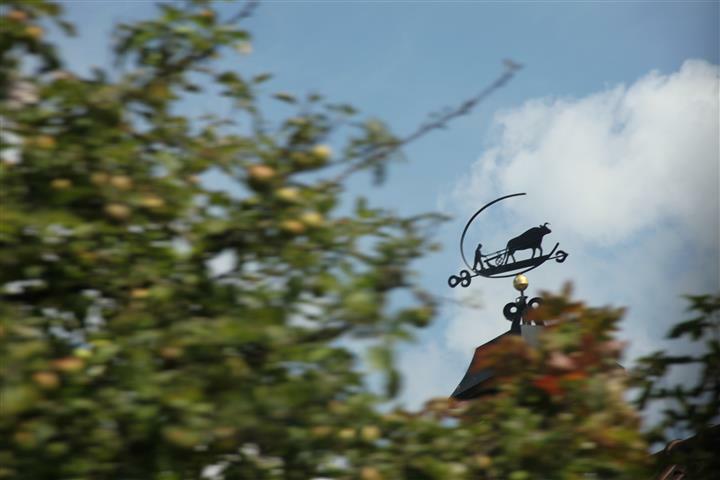 Some of them are custom designed, most others fall into two groups, the historically classical variety that consist of things like horses, horses pulling ploughs, animals in general, all sorts of birds, sailing ships, and images centered around sport. I managed to accumulate some of each category over the last year and will add these to my collection now. 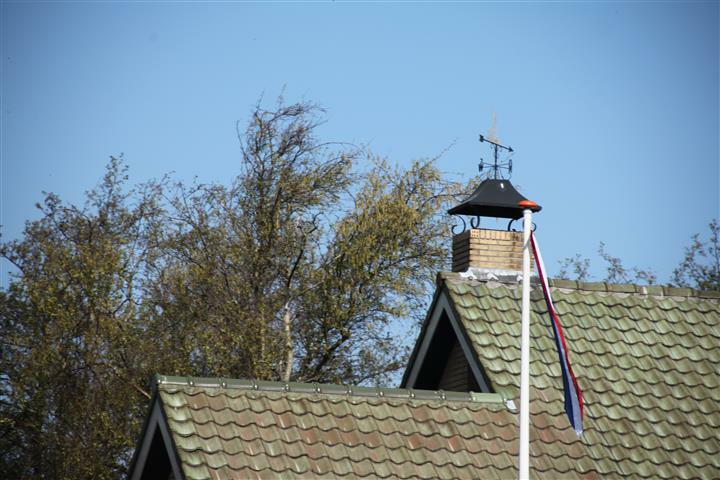 Often houses in villages or in the countryside are surrounded by gardens full of trees, so snapping these photographs can be harder than you’d think, especially from a moving vehicle with traffic behind you. Sometimes I get lucky and we are stationary, waiting to give way at an intersection, but this is the exception to the rule, so please forgive a few less than perfect images. I have a ton of archive photographs on my hard drive and in recent years have been slowly turning these into blog posts, so that my “diary of life” can continue via the WordPress schedule even if some days I am not well enough to post myself. Many of my readers know that I love discovering the quirky parts of everyday life. 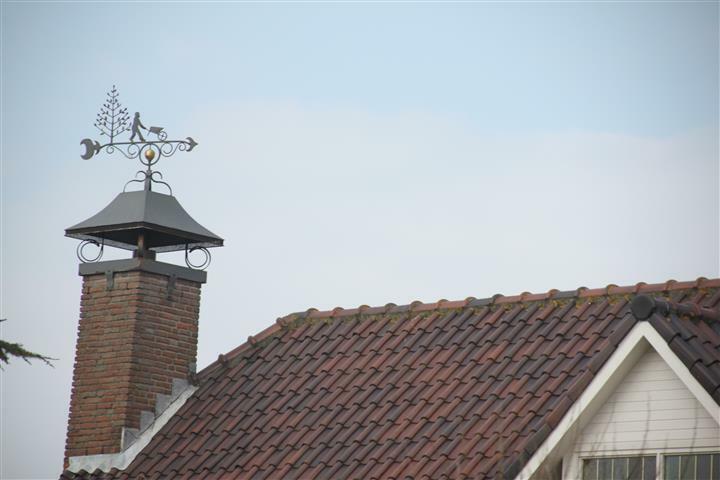 I have photograph collections of funny shaped letterboxes, painted electrical substations, street art and murals, statues, street paving stones of all shapes and sizes, patterned drain covers, and now, introducing yet another addition to my collection: weather vanes. 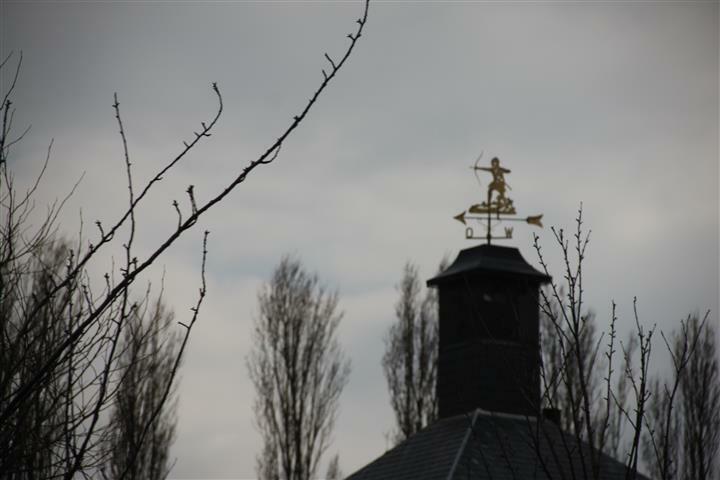 Even before my blogging days I was captivated by weather vanes that are the norm in some areas of the Netherlands. 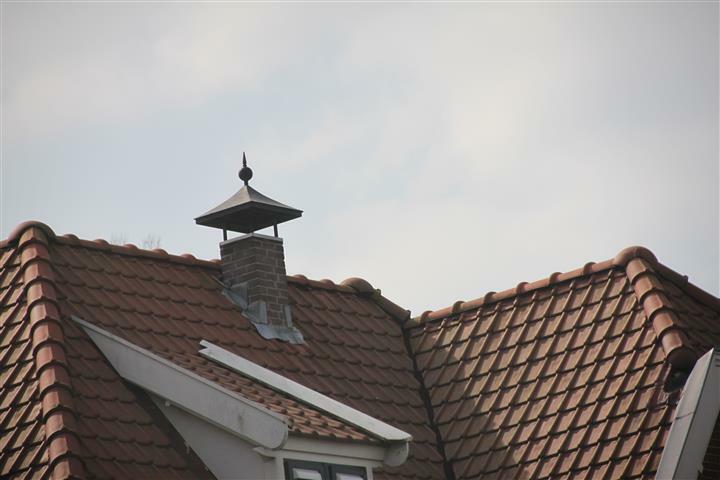 Mostly they are found in villages where houses, unlike in Dutch cities, are free standing, stand alone structures. 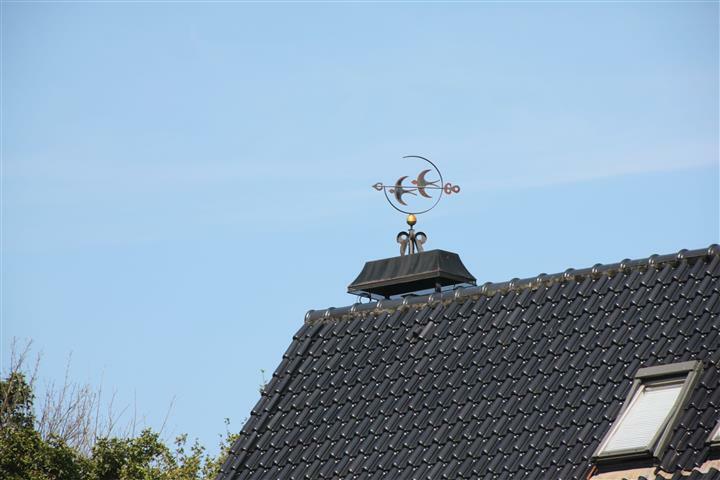 On the outskirts of the Hague and around the Westland there are whole groups of houses that sport weather vanes, the main problem when trying to document them is that they also the houses that have gardens and large trees, so getting photographs can be tricky. 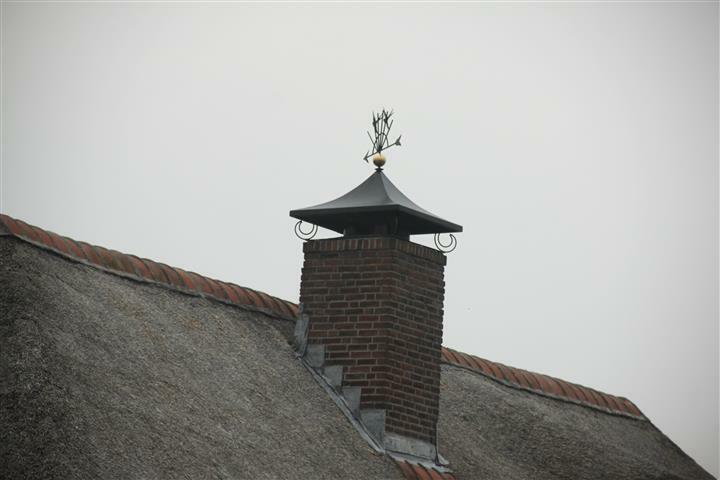 The owners of these houses seem to like to add not just the usual cap on top of the chimney’s to keep out rain and snow but also to decorate that cap with an ironwork adornment that incorporate figures, birds and animals as well as the odd human figure. 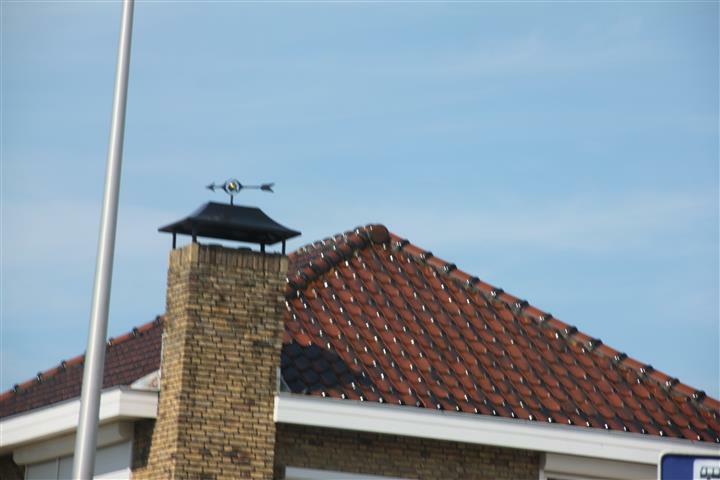 Structures such as ships also make an appearance, but so too do thing like the humble plough so I think that the only limit is the imagination and wallet size of the house owner. 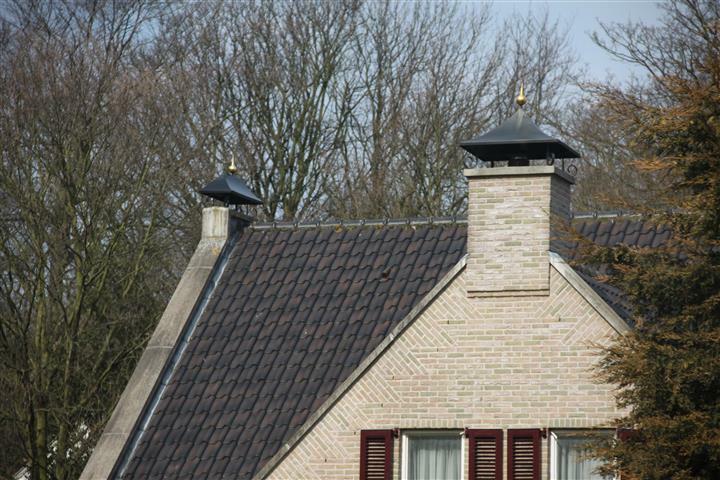 The most expensive looking one I’ve seen is of a gold coloured heraldic lion of the sort that’s found in the Dutch royal coat of arms, but I’m only saying that because the gold colour looks expensive (which is of course probably the impression it was meant to convey if it was expensive or not). As usual my lack of mobility in the last four years has meant that I have had to build up my photographic collection from the confines of a moving vehicle, so as usual some of the photographs could be framed a bit better, but it was the best I could do at the time. 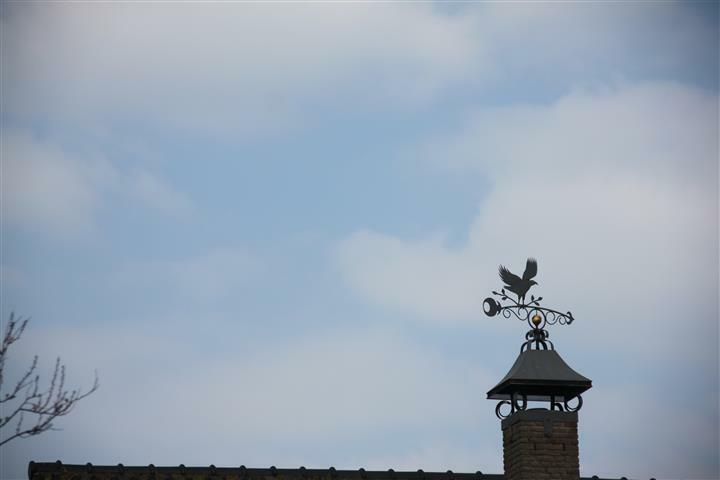 I love pattern, design, ironwork and decoration so what’s not to like about a weather vane? Life needs all the decoration it can get.